Wow, does life ever just ‘coast’? For those who live in America, I pray all of you had a Happy Thanksgiving. A few things have happened the past couple of weeks that have dramatically changed my schedule, all while starting and adjusting to a new job! First, my oldest son (who broke his hand last month and had to have surgery and pins) got his stitches taken out on a Friday and was trying out for the high school freshman basketball team the following Tuesday. Was I a nervous wreck? Of course. Well, he made the team and is so excited. That act alone added daily practices (including weekends and school breaks) and games from now until March. My daughter was in the school musical last month which was awesome. She did a great job and was happy to be a part. When we asked what she planned on trying next she said maybe some after school clubs because she didn’t really enjoy sports…ok. Well, out of the blue she decided to try out for the 7th grade basketball team and by surprise, she made it! She came home shocked herself and said, “I don’t know what happened.” So, tack on another practice every day plus games through February (on top of dance class). Then of course my youngest, yes, he is playing basketball too, practice twice a week plus two games a week. Never has my schedule been more packed. Today I am writing on the importance of rest. Besides feeling like a taxicab at night and weekends, I am working full time and am now trying to get ready for Christmas…it can be too much. What are some of the top side effects of stress and not enough rest? Weight gain, sleeplessness, and mood swings…yes, yes, and yes. We have now entered the highest ‘stressful’ seasons by itself and without enough rest and relaxation, it could be very bad for your health. Take the time to sit still (which is hard for me to do too), breathe and be thankful, it helps the attitude. On another note, I was thinking about those who might be struggling right now, like one of my old customers who lost his son this past summer from cancer. Life is hard. People have asked me how I hold on to hope through all the ups and downs of cancer. My answer is simple, sometimes it’s impossible but others have been there to fill me with hope or fill up my tank so to speak. Since the beginning of my cancer journey I have received numerous phone calls, cards and e-mails, some even from strangers, and I have saved them all. 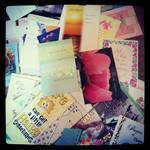 When I am feeling down all I have to do is read a few emails or cards and I start feeling that hope again. I also 100% believe that God has a plan and my hope is in Him. Sometimes we just need a word of encouragement to remind us how loved we are or how much we matter and when we feel that hope ourselves, we can share it with others who may need it. Can you think of anyone who may need a card or a text for a little encouragement? Why wait? Today I wear Lancome L’Absolu Rouge in Bordeaux. This is my favorite formulation of Lancome lipstick because it’s moisturizing and smooth. My fave red, Merlot, comes from this formula , but today I chose Bordeaux which is a soft burgundy color with lots of shimmer…perfect for the holiday season. I love it! I received the copy of your book and my Sephora lipstick set this past week. How exciting! I love them both!! Of course, since then I’ve tried out all the lipsticks! The colors are perfect for me, soft and natural, just the way I like them. And I’m looking forward to taking some time to “rest” and read your book. Thank you so much for having the contest and for sharing your journey with us! You are very welcome Carole! I just attended a presentation by Team Impact that emphasized encouragement…..to only speak words of encouragement is not only a gift to others but to ourselves….I’m so happy you have the strength to support all your kids…its your time….enjoy and take care of yourself too!